Ideal post injury / surgery ambulating knee support with rigid medial / lateral uprights to provide medial / lateral support of the knee joint. 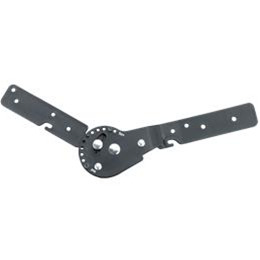 ROM hinges provide controlled motion if necessary with knee flexion and extension controls. Simple front wrap design for easy application and removal. Neoprene material conforms easily to the shape of the leg to eliminate brace migration. Orthotic therapy providing medial and lateral control of an injured or surgically repaired or weakened knee. ROM hinges allow controlled knee range of motion for patients requiring limitations in knee extension or flexion. The orthosis ROM hinge can be set in 15 degree steps to control both flexion and extension motion in the brace. Ideal for ambulating patients who require medial and lateral knee joint support during gait. 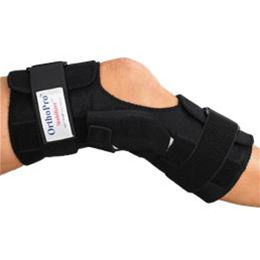 The front wrap design of the neoprene knee brace support facilitates easy brace application. Small OP 404-0 13" - 16"
Medium OP 404-1 16" - 19"
Large OP 404-2 19" - 22"
Xlarge OP 404-3 22" - 25"
Xxlarge OP 404-4 25" - 28"